Kickstarter time! Ex-LucasArts game developer Ron Gilbert is returning to what he does best. Back in the late 80s, the man revolutionized the point-and-click adventure genre with the SCUMM engine and a wonderful little game called Maniac Mansion. His successful run with his engine saw the onslaught of classic after classic like the Monkey Island games before he eventually left to create children's educational software for many years. Most recently, he saw a brief stint with former co-worker Tim Schafer at Double Fine to create The Cave, and now he's obviously got the bug to create something new and yet delightfully old. 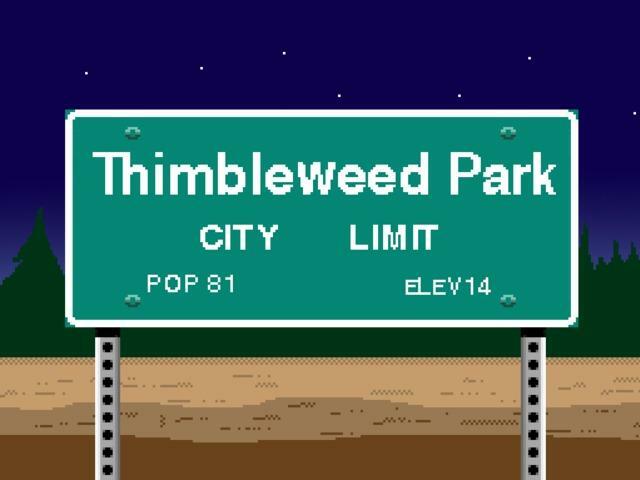 Gilbert currently finds himself on Kickstarter asking for crowd-funding for Thimbleweed Park, a spiritual successor to his classic Maniac Mansion. His goal stands at a modest $375,000, with $80,000 in the bag after a single day, and judging by how many lives his games have touched over the years, I am willing to bet this one will be a winner. The SCUMM games are regarded as immortal classics that are just as much fun to play now as they were back in their heyday, and many fans remember them fondly. Now that point-and-click adventures have seen a renaissance through the indie scene, Gilbert obviously needs to be a part of it. He has the art style going just right to channel the first few SCUMM games, and he describes Tumbleweed Park as "like opening a dusty old desk drawer and finding an undiscovered LucasArts adventure game you've never played before." Not only does Gibert sport the best first name in history, he has the reputation and clout to make this a wonderful game. The Cave wasn't perfect by any means, but Gilbert's unmistakable sense of humor shone through and hasn't lost its touch since the late 80s. I think he'll be much more comfortable working in the genre he knows best with complete creative freedom available from the indie scene. I've been a good boy avoiding Kickstarter as of late, but this is one I feel I can't pass up. Before my parents wouldn't let me own an NES, Ron Gilbert's adventures were my main outlet for my gaming cravings. They are largely responsible to teaching me how to read, write, and properly use verbs, prepositions, and objects in a sentence. The are probably largely responsible for how I scored my job here.